Kid’s First Early Childhood Intervention (KFECI) ​​is celebrating its 10th anniversary milestone with a day of fun and sport for kids called ​“​​One Fun Day: A Family Day of Festivities for All Abilities”. 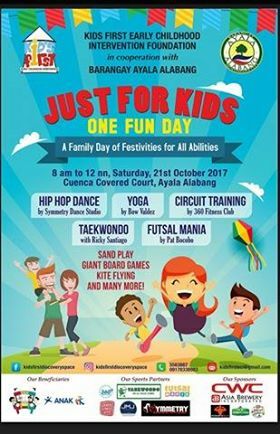 ​Expect a day of genuine fun and laughter as Alabang-based learning center, Kid’s First Discovery Space, holds special lessons on hip hop dancing, taekwondo, futsal, yoga, and circuit training. An area will also be dedicated for sand play, giant board games, kite flying, and many more! Kid’s First’s “One Fun Day: A Family Day of Festivities for All Abilities” will take place at the Cuenca Covered Court in Ayala, Alabang on Oct 21, Saturday from 8am to 12 noon. “It’s going to be a day that’s dedicated for all kids and their families. This non-competitive, fully inclusive event is for everyone - people of all ages and abilities are encouraged to participate. It could be an opportunity for the kids to enjoy activities without fears and worries. No winners and no losers. Just simply a day of fun,“ says Kid’s First educational administrator, Vanessa Morales-Balquiedra. You may contact Ces of Kid’s First Discovery Space at (02) 556-3887; 0917-8338983 or email kkidsfirsteci@gmail.com for more information.